Sunshine Plumbing is a family owned and operated plumbing business that services homes and businesses of all types around Sunshine and surrounding areas. Like you, we’ve experienced tradespeople who: show up late, or not at all; who will spring a surprise cost on you; or, do poor quality work. We understand how upsetting this can be. With 50 years of experience under our belt, it’s our mission to provide a plumbing service with great communication, to be up front about costs and to do top quality work. We’re family owned, so word of mouth and the quality of our work are the foundation of our business so you get great service. We offer 24/7 personal service – no answering or paging services so you can always reach a human for support. We personally answer each call so you get the advice and information you need. We look after you from the first call, to the completion of your job. You’re never left wondering what’s going on. We make sure you know when we’ll be there, so you’re not left waiting unnecessarily. 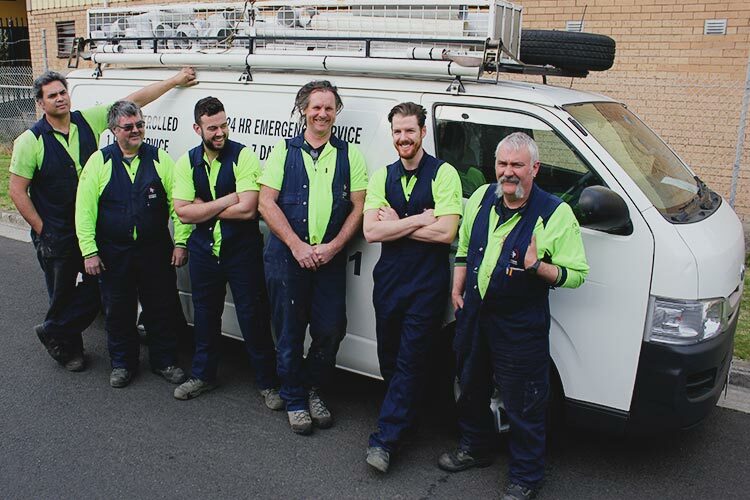 If you’re wondering about our qualifications, Sunshine Plumbing is a member of the Master Plumbers and Mechanical Services Association of Australia. We’re committed to the ongoing training of our team so we can provide you with the best service. All service people hold Occupational Health and Safety Red/White cards as per national requirements for working in the Construction Industry. Our plumbers are qualified/registered and all have Working with Children’s checks and National Police checks. With 35 years of experience of plumbing under his belt, Mark is our problem solver and estimator. If you think something can’t be done; think again – creative solutions are his expertise. Commercial, Industrial or Domestic plumbing, Mark loves the challenge of achieving a solution to meet your budget or requirements. When he’s not problem solving, he can be found dirt bike riding in the bush conquering large logs with a single jump. He can also be found talking about plumbing (or motorbikes) anywhere, anytime, to anyone who will listen. Cat has been managing the Sunshine Plumbing office for 25 years. When she’s not scheduling the plumbers jobs and keeping everyone in line, she can be found conquering marathons, running trails and walking Trixie, the wonder dog. Kathy has been ensuring the supplies arrive on time for 16 years now and when she’s not placing orders or answering your calls she can be found honing her quilting and knitting skills. Andy was part of the Sunshine Plumbing family before the current owners took over in 1994; he was born and bred in Sunshine and is part of the fabric of Sunshine Plumbing. With 39 years plumbing experience Andy is well skilled to complete any commercial/industrial or domestic installation or maintenance work required. When he’s not finishing off your bathroom renovation or rebuilding your fire service, he can be found snowboarding the slopes at Bulla, touring on his Harley, or creating timber masterpieces in his workshop. He can also be found talking about plumbing or carpentry or motorbikes. Chris was also born and bred in Sunshine and has been part of the Sunshine Plumbing family for 19 years. If Andy is the fabric, his brother Chris is part of the furniture. With a background in engineering, driving the truck and excavator, pre-fabricating plumbing items in the workshop; repairing tools, delivering parts and general housekeeping are all part of his day. When he’s not at work Chris is busy building fully operational remote control model submarines, making props on his 3D printer and planning his next Comic-Con adventure. Johnny joined the Sunshine Plumbing family 7 years ago. Originally hailing from across the ditch Johnny is our international plumber. Having 33 years’ industry experience Johnny is well equipped in a wide variety of domestic and industrial maintenance and new installation plumbing applications. His favourite plumbing jobs are ones where he gets to interact with our customers, learning about their lives while he’s solving a problem for them. When he’s not unblocking a drain or fixing a burst pipe in a Nursing Home or a residential property, Johnny can be found spending time with his family, playing guitar in the band and walking the most recent addition to his family: Snowy (the wonder dog II). Matt joined us as a first year apprentice in 2012 and on completion of his apprenticeship decided to stick around and see what else he could learn from the rest of the team. With another 3 years’ experience on top of his apprenticeship, Matt is mastering his trade and has lots of experience in new installations fitting out commercial Laundries and Dental Surgeries as well as general maintenance in the domestic and commercial/industrial sectors. When he’s not fitting into small spaces the other plumbers can’t fit, Matt can be found aspiring to be Fed on the tennis court, Norman on the Golf Course and spending time with his better half. After joining us for a couple of years in the early 90’s, James packed up his family leaving our family for the west coast of Australia circa 1995. Fast forward 20 years he finally decided the weather really was better in Melbourne and has returned to us. With 35 years of industry experience James is prepared to tackle any domestic or industrial maintenance plumbing issue sent his way. When not tracking down the source of a leak James can be found on your TV (Million Dollar Minute; The Chase) and trying his luck at the local club quiz or raffle nights and most recently welcomed his second child into the world. Luke joined us mid 2016 and is in his third year of his plumbing apprenticeship and is on his way to becoming a plumber. When he’s not learning his trade he can be found keeping fit and catching up with friends.